XL & decorative male Ming Dynasty pottery attendant on lotus throne! 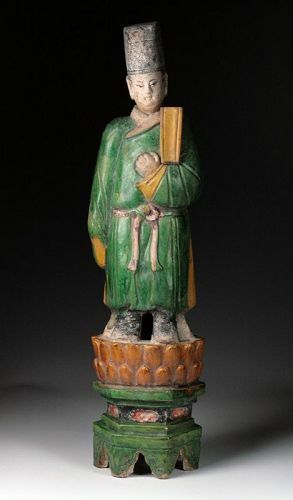 A large, Museum Quality pottery figure of a male attendant carrying a fan or a book under his arm. The figure dates to Ming Dynasty, 1368-1644 AD. The figure is placed on a large Lotus throne on top of high hexagonal plint, both in fine Sancai colours - a two-colour green and yellow glazed robe. He wears a high hat. Finely painted facial details. Lotus thrones are very rare for Ming pottery figures. The head is attachable as often seen on the largest figures from this period. Size: The figure measure c. 53-54 cm. A very impressive and massive conversation piece and very decorative. This type is one of the largest known of this design. Condition: Superb, finely preserved glaze and pigment. XL & decorative male Ming Dynasty pottery attendant on lotus throne! XL & superb male Ming Dynasty pottery attendant on lotus throne! XL & superb male Ming Dynasty pottery attendant on lotus throne!